Beth Silverman was Southern California’s women’s softball high school phenom from 1985 through 1988. As El Camino Real’s varsity starting pitcher for four years, the Conquistadors won the City 4A Championships in 1985, 1986 and 1988. During each of those years, Beth was named First Team All-League and All-City, and League and City Most Valuable Player. In 1985, with a 24-0 record and an earned run average of 0.05, she was Cal Hi Magazine’s all-sports Freshman Female of the Year. One year later, Cal Hi named Beth softball’s Sophomore Player of the Year and USA Today ranked her among the ten top pitchers in the United States. Beth was again undefeated at 19-0 and repeated her 0.05 ERA, adding a .450 batting average to her MVP package. In 1988, with a 30-2 record (lost two games in tournament play), an ERA of 0.065, and a hearty .550 batting average, she earned Cal Hi Magazine’s nod as Softball Senior Player of the Year. 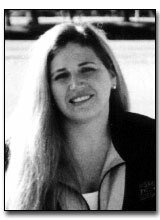 Beth competed seven times in the North American Maccabi Youth Games from 1988 to 1998. She was undefeated during that long period, registering 49 consecutive victories! Over ten years, Beth gave up a total of just one earned run and led Los Angeles to seven gold medals. Considered a coach as well as a player in the Maccabi Youth Games, Beth was awarded the Barry Sandler Trophy for her dual efforts.